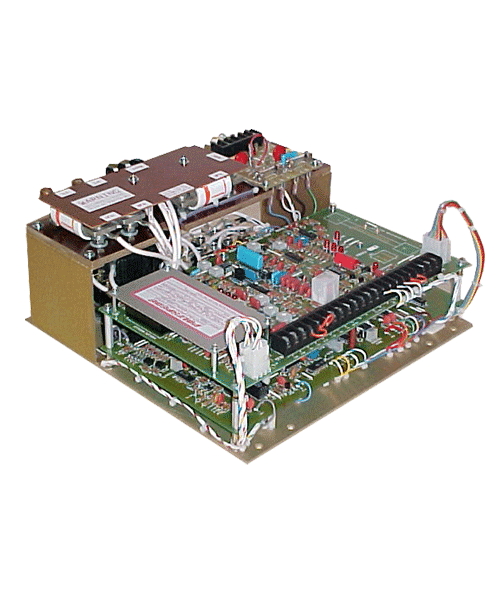 PRD2 is a low-cost fast response, regenerative SCR DC motor control. It offers full features in a cost-saving half-wave design. The PRD2 powers industrial DC motors for starting, stopping, reversing, accelerating or braking in either direction. When a PRD2 regenerative control is signaled to brake the mechanical load, it causes the motor to act as a generator. The braking energy is sent back into the AC power lines, eliminating the need for heat-producing dynamic braking resistors. Besides simplifying the overall installation, the PRD2 also provides faster braking than is possible with non-regenerative controls. A PRD2 control is an excellent choice for high duty cycle indexing and reversing; controlling high inertia loads; also hoisting or other applications requiring controlled hold-back torque. The unique circuit design provides a 4 to 6 Hz velocity and torque loop response in the PRD2. There are no overshoots during acceleration, deceleration or reversing. The PRD2 interfaces easily with programmable controllers, or directly with process instruments that provide an analog signal output. + 0.1% with tachometer feedback. Note 1: Tach feedback is available for other motor/tach combinations not shown. Tach feedback option does not include tach generator. PRD8 is a fast-response, regenerative SCR DC motor control designed for powering and controlling industrial DC motors. It supplies starting, stopping, reversing, accelerating or braking functions in either direction. A PRD8 control is suitable for high duty cycle indexing and reversing, controlling high inertial loads, hoisting or other applications requiring controlled hold-back torque. The PRD8 provides control through zero speed crossing. With an optional plug-in interface the PRD8 can be used in high resolution positioning servo applications. When a PRD8 is signaled to brake the load, it causes the motor to act as a generator. The braking energy is sent into the AC power lines, eliminating the need for heat-producing dynamic braking resistors. Besides simplifying the overall installation, the PRD8 also provides faster braking than is possible with non-regenerative controls. The unique circuit design provides a 12 Hz velocity and torque loop response in the PRD8. There are no overshoots during acceleration, deceleration or reversing. The PRD8 interfaces easily with programmable controllers, or directly with process instruments that provide an analog signal output. 50 VDC per 1000 rpm standard, other ranges optional..
PRD12B is a high performance regenerative DC speed control. It provides independent adjustment of speed and torque. Speed and torque are always under control, even during acceleration and deceleration. The four quadrant design allows electronic reversing without contactors. Although a DC loop contactor is an optional feature, it serves only as a disconnect between the motor armature and the control output. 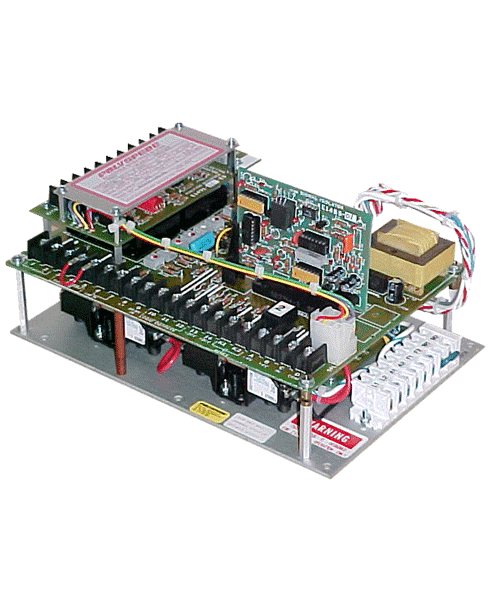 The PRD12B uses twelve SCRs arranged in two phase controlled bridges connected back-to-back. This circuit supplies regulated forward or reverse current to the DC motor, independent of motor speed or direction. Because of the twelve SCR configuration, regeneration is accomplished through the armature of the motor, rather than through the field, enabling much quicker drive response. 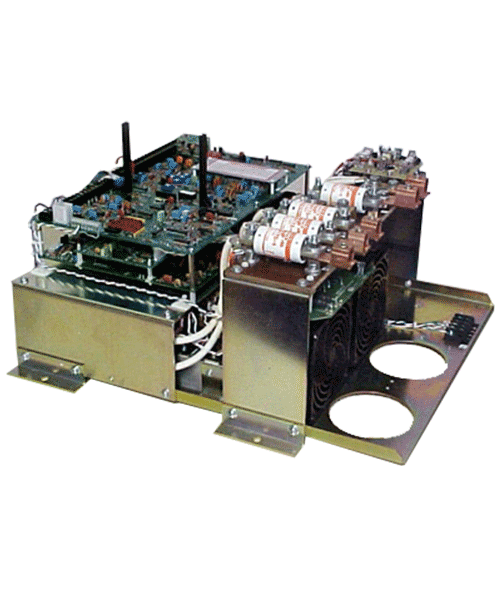 In addition, the 12-SCR control is designed to operate on a 230 or 460 VAC three-phase service, directly from the customer’s AC input lines. No input transformers are required. The PRD12B has cross firing of the SCR forward and reverse bridges providing smooth control through zero-speed crossing.